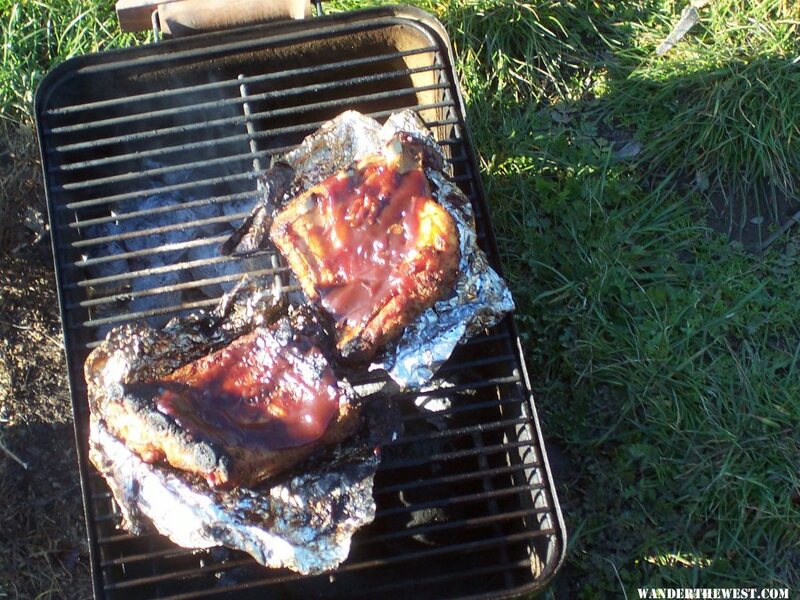 Always have enjoyed ribs, has anyone done them while camping (over/under fire) . At home its usually three to four hours on low heat in tinfoil in the oven. Done them on the BBQ same way with no problems. Just curious if anyone has cooked them with the campfire. Or has anyone precooked them most of the way then tossed them in a cooler to finish on the fire?? I buy the pre-cooked ones. Ten minutes on the bbq and they're done. I don't think I have the patience to be a good rib cooker. I do them the same as you, long slow precook in the oven and finish with smoke on a grill. Did just as you suggested on one occasion. Brought the pre-cooked and finished them in camp. It worked fine. We parboil baby back ribs, then finish on the BBQ. Works ok, but I’ll try some other methods mentioned here. Okay, I have done it several times on my old hibachi out in the field and recorded how I did,& took pictures and posted the process in my gallery (if I can figure out how to move it here from the gallery I will). First I cut it up into 3 or 4 rib (pork) pieces and wrap them with foil with some water and slow pre cook/par boil them for an hour or so. It takes allot longer to do it.than home on a regular BBQ Then I repeat the process with lots of cooking oil. (both regular and spay on) on the foil.and monitor/spaying/turning it allot to keep it from burning to much. The cooking time varies from about an hour to a few hours. Once they look cooked enough put on the BBQ sauce and watch them closely so they do not burn. Remember this field process and what is a burnt rib or two -they still taste great with a beer or two ! My old hibachi is probably 30 or so years old and I always carry it with me to cook because it does not take up much space and can use it to cook lots of things. [in case] I can not pull the photos down from the gallery, just go into the my gallery, go to California (deer picture) and work back to find them. This is a small field BBQ and I never carry my big home one or a gas type with me As a note I bought the BBQ type pan that Dirty Dog was selling years ago and also posted/w pictures here how it worked in my back yard and carry it under the couch in case I need to cook for a bunch of people sometime. Enjoy! Edited by Smokecreek1, 22 February 2019 - 10:44 PM. Thanks who ever moved/posted those pictures down here! Edited by Smokecreek1, 22 February 2019 - 08:30 PM. You are welcome, Mr. Smoke. Mouth watering discussion ! Was wondering if there is a best brand for "precooked" ribs? We usually buy our meat from neighbor farms so don't buy "store bought" meat regularly (exceptions are "Boars Head" brand dogs and bacon). 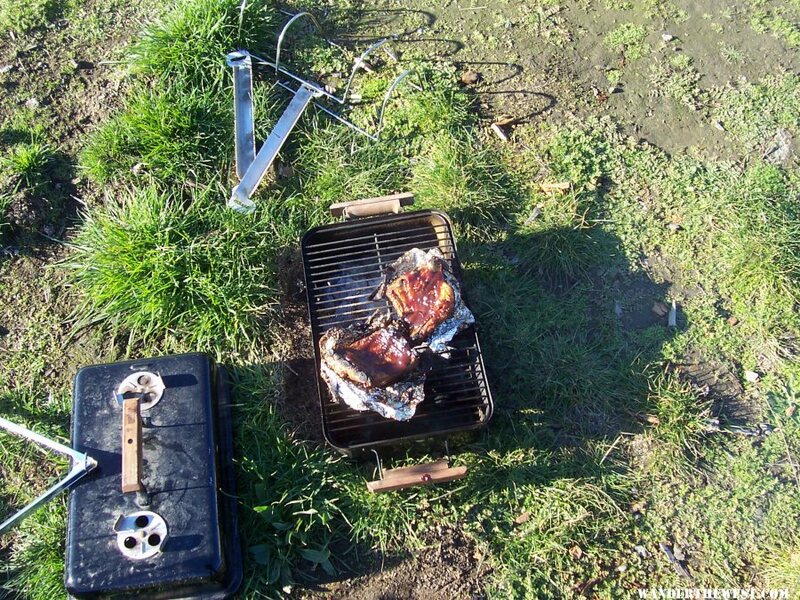 It is such a great meal when camping and would love to try it but have shied away from the prep. I forget which brand we have been buying as Safeway has changed what brands they sell....but they are the kind that come in a pretty decent BBQ sauce and you are directed to cut the slab into several 2, 3 or 4 rib sections and then you can microwave them. I think I'd like to try those by cooking as directed and then wrapping the sections in tin foil and then reheating them on the BBQ. Using a meat thermometer, you can punch right through the tin foil to monitor the temp. When they are "done" I think I would like to unwrap them and get a little of the crispiness on them by putting them on the grill for a couple monitored minutes prior to serving them up. Thanks for all the input , I will definitely be doing ribs this year... I will probably go with the pre-cook and then onto a low fire for the last 1/2 hour. Gets me hungry just thinking about it..